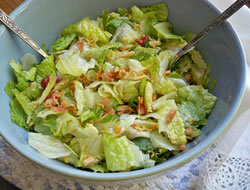 Crunchy oriental flavored salad. 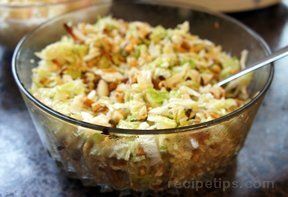 Don't mix it together until just before serving otherwise your cabbage will become soggy. Crush Ramen noodles before toasting. 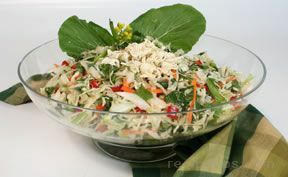 Toast noodles, almonds and butter in frying pan until golden brown. Set aside. 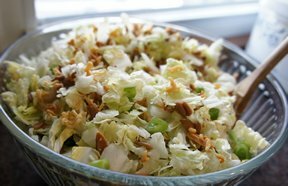 Chop green onion and cabbage. Combine oil, sugar, vinegar, soy sauce and Ramen noodle seasoning packets. Just before serving, mix all ingredients together. "A sure-fire hit to bring anywhere. Usually you don't have to worry about this since it's all gone anyway, but it doesn't keep once it's been dressed."